I’ve eaten pāua fritters in New Zealand, had it stir fried and braised in Cantonese restaurants, but however cooked, I can’t honestly say that I’ve ever much liked it. And the photographs that accompany its online recipes do little to increase its appeal. A is for abalone, and in dictionaries of food and cooking, you’ll find it up there on page 1. An expensive delicacy. Prized by Chinese and Japanese chefs in particular. But my interest in abalone isn’t culinary. I’m coming at it more from a cultural and environmental history perspective. Abalone is the common name for a number of species of sea snails. Biologists label them marine gastropod molluscs, and they belong to the genus Haliotis—as does pāua. They live along open coastlines in what’s called the swell zone, and to help them hold on to rocks in these waters they’ve developed a large, muscular foot. Unlike scallops or mussels, which have two shells hinged together, abalone and pāua have just the one. Black lip abalone at the Sydney Fish Market, 2018. An important part of the diet of indigenous peoples on both sides of the Tasman, pāua shells with their iridescent blue-green lining also feature in Māori art and craftworks. Although it’s often presented as such, the settler history of Australia was never exclusively British. I’m always alert to stories, snippets and incidental remarks that reveal the cultural diversity of nineteenth- and early twentieth-century Australia. That’s how I came across the Chinese mutton-fishers of Tasmania. A 1937 article by Thomas Dunbabin mentions that ‘fifty years ago this south had a Chinese colony … engaged in gathering and curing mutton-fish’. Early Europeans called abalone mutton-fish and found it unpalatable—an opinion shared by Dunbabin who compares its taste to ‘boot-leather’. 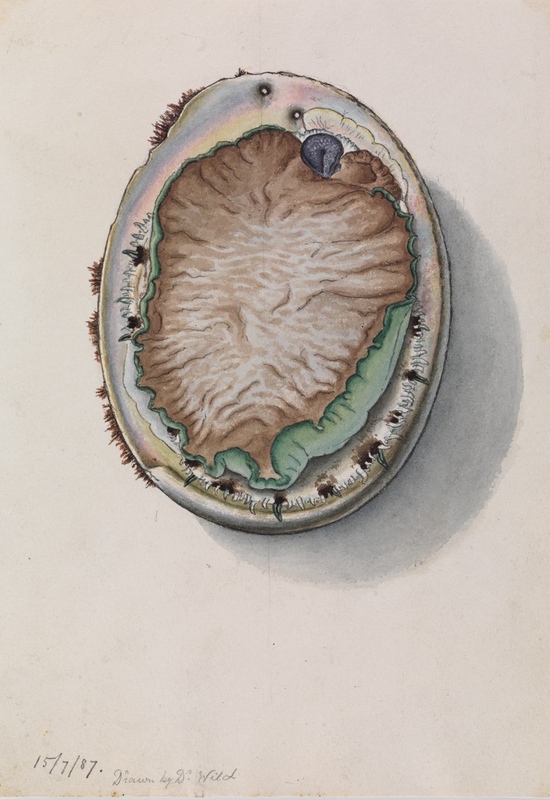 Green-lipped Abalone, Haliotis laevigata, by John James Wild, 1887. The story of these Chinese mutton-fishers in Tasmania is sketchy; accounts are sparse, written records limited. The Royal Society, at its monthly meeting in March 1869, noted a presentation of ‘two specimens of the dried mutton-fish (Haliotis sp.) prepared by the Chinese at Southport, near Spring Bay.’ In his accompanying explanation Mr Justin Browne wrote that once caught the fish is ‘dried in a slow oven built for the purpose’, then packed for export. In a pre-refrigeration age knowing how to preserve food was an important skill. Jane Grigson’s Fish Book runs well over five-hundred pages, but she gives abalone a mere page-and-a-half. And a single recipe: Ormeaux au Muscadet. (Ormeaux is the French name for abalone.) After pounding the flesh ‘energetically’ it’s prepared with butter, herbs and white wine. Cooking time 30-45 minutes. I’m wary of questioning the great Jane, and perhaps that pounding makes all the difference, but isn’t abalone, like most seafood, best cooked very quickly over a high heat? Or for a long time on a low heat? 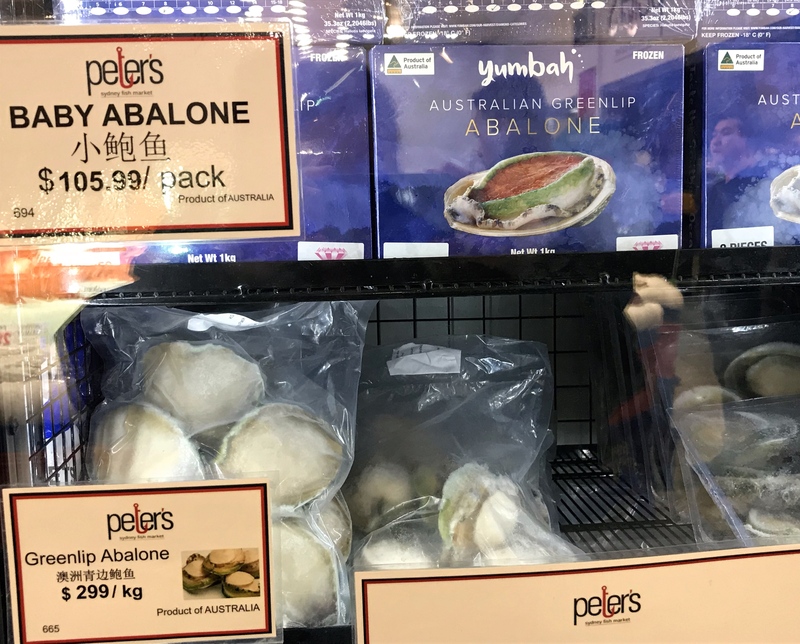 Closer to home, abalone were at the centre of a dispute between commercial interests and native title in a recent ABC news item. Fisheries NSW accused an Aboriginal man of taking too many abalone, in breach of regulations. Fortunately the case against the man—who hails from a long line of Indigenous divers—was dropped. Nowadays abalone is farmed as well as wild-caught. I live near Sydney’s Fish Market, so the other day I took a short walk to see if abalone was on sale there. It was—frozen. Frozen abalone at the Sydney Fish Market, 2018. In Dead Seas: How the fish on our plates is killing our planet, Taras Grescoe says that much of the abalone now sold is poached. From an upscale seafood restaurant in Shanghai where abalone in glass tanks wait ‘to be selected by a diner’, he reveals the worrying fact that ‘China manages to import twice as much Australian abalone as Australians are legally allowed to harvest every year’. 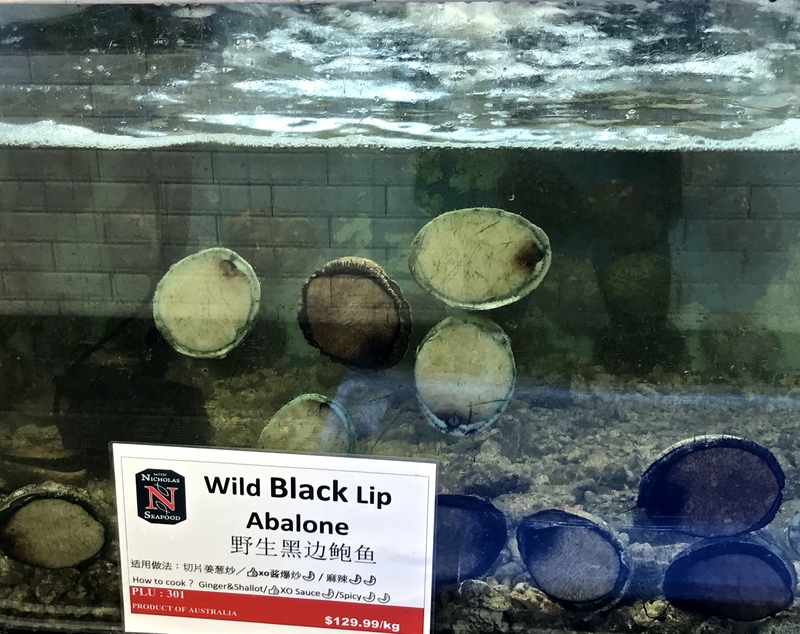 Grescoe’s book was published in 2008, but if this 2017 story from the ABC is any indication, the abalone black market is alive and flourishing. Drama and risk-taking surround abalone, but what does it actually taste like? A bit salty, a bit sweet, somewhere between a scallop and overdone calamari. I didn’t buy it from the Fish Market that day, not because it was frozen, but because I think you can get other types of locally grown seafood that taste much better and cost less. As for the Chinese mutton-fishers, their business suffered when when the Victorian Government imposed a tariff on seafood in 1872, and then increased it three years’ later. But their pioneering endeavours are remembered—kind of. The name Chinaman’s Bay recalls those who fished off Maria Island. But of those migrants who worked out of Southport or Ketchem Island (the site of Dunbabin’s reference), there’s no trace.